I have been doing a lot of thinking over the past few months about the Federal Vision. One area in particular, namely, most in the Reformed camp believe that the FV is outside of the bounds of the Reformed tradition, while all those in the FV claim that they are clearly within it. As I have been pondering this issue one reason seems to fit best with what is going on. I want to share this reason with our readers so we can discuss this point. I am not saying that this is how it must be, nor am I saying this is how it is, but rather, I am suggesting one possible way to explain this phenomenon within Reformed circles. Many in the FV point back to John Murray as their theological root. That is, those in the FV believe that they are in the theological trajectory of John Murray. This may be the case. However, those in the FV have moved past Murray on issues of the Covenant and other key Reformed distinctives. Even though those in the FV can point back to Murray as their theological ancestor, they have moved far enough past him to put themselves outside of the camp. Another example of this may be Lee Irons (I am not up on all the ins-and-outs of what happened with him, but I do know that the OPC saw fit to remove him from their denomination. ), Irons stands in the theological trajectory of Meridith Kline, who is well within the Reformed tradition. Irons can point back and show who his thought is rooted in Kline, but, as the OPC decided, he is outside of the Reformed tradition. I think something similar is going on with the Federal Vision. I think they can look back to Murray and pick out a few of his thoughts and "develop" them to the point that that are outside of the Reformed Camp. Those in the FV are unaware of this because they think they are just following Murray, but, what they do not understand is they have taken Murray in a direction that leads them outside of the Reformed tradition, a place Murray did not go. Again, this is just a "theory" that I have about why the FV thinks they are within the Reformed camp, while the majority in that camp believe them to be out of it. I am trying to make sense of this "mess" and this has been helpful for me to understand what is going on. That's hilarious. Although, I think most of us in the continental Reformed tradition would consider Lee Irons to be well within Reformed orthodoxy (I've never heard anyone from the URC say anything negative about him). Well, the OPC did "kick him out" of their denomination. So, they think his views are not in line with their confessional standards. Yes, but John Calvin himself didn't hold to the view of the Sabbath the OPC teaches either. Are the Westminster Standards more the true definition of Reformed Orthodoxy than the Three Forms of Unity? My point being, Lee Irons may certainly be outside "OPC Orthodoxy", but that's a different thing from being outside of "Reformed Orthodoxy", which is much bigger than the denomination of the OPC. I agree, your point is right. There is more to Reformed Theology than the OPC. Since you're not up on the ins-and-outs of what happened with Irons, let me tell you that the (FV-sympathetic theonomic) folks who orchestrated his censure would have been happy to get rid of Kline as well. Make no mistake about it. You have to be really careful when you post things about what happened to other people. I just saw your post link Lee's blog, and it is obvious that you are not familiar with all of the facts and the exact issues behind the OPC censure trial. In Lee's upper register site, he posted ALL of the documents pertaining to his trial (so he isn't hiding anything), and if you actually read through all of the pages, you will realize that the case isnt simply cut and dry. Lee makes many good points that are actually in line with a lot of the contempories of the Westminster Divines. Read through all of the documents to understand his views and the exact situation concerning his trial. He even admits that he had sinful conduct during the whole ordeal. But, in the end, this sinful conduct does not compare to the even more disastrous and very unexegetical, a-historical, and excessively theonomically-influenced trial that ultimately censured him. You need to read all of the documents before making such a response as you did. Additionally, you cant simply use the logic of saying "Well, the OPC censured him, so therefore he is wrong and the OPC is right." I can use this analogy for the PCUSA as well. "Well, the PCUSA passed a resolution to allow women pastors, so therefore, it must be OK."
And in contrast to your post, there are many people who wanted to see Kline out of the OPC as well. So, he wasnt viewed as the bedrock of reformed orthodoxy as you might think. Therefore, your diagram is clearly not accurate. Once, I even met a person that said that Kline advocated homosexuality, which is clearly not true. (I have even confirmed this with Vandrunen). In any event, I feel that you did catch a slight shade of how complex these issues can be, but, you really have to read Lee's trial documents before making such a hasty statement as you did. Be very careful when you make statements about situations which you dont know the full background. I know that you were trying to do some thoughtful analysis, but you have to remember, seminary only gives you the basics. I have met complete theological morons who came out of very good reformed seminaries (ie: WSCAL, and WTS). BTW: There are some people in the reformed camp who would even say that Murray was outside of traditional reformed thinking.. Murray himself even admitted that he was "recasting" the idea of the Adamic Covenant of works, when he was working through it. Let me begin by say that I was not at all trying to "bring" Lee Iron's "in to this." If you read my post I did say "Another example of this may be Lee Irons." I did not say that this is the case or that this must be the case. If my bringing Irons in to this was offensive, to him personally or others, I do apologize. I was trying to make a point regarding the FV and not Irons. Again, the point of my post was not about Lee Irons. The issue I was trying to wrestle with was why so many in the FV understand themselves to be in step with Reformed theology, while so many others think they are not in step. In the illustration, I put Irons where I did based on the decision an orthodox ecclesiastical body, the OPC. If the OPC is wrong about Irons, then I am wrong. Thus, if you think the OPC erred in their ruling on Irons, then you will think that I am wrong in placing him outside of the circle. Again, since the Irons issue was a side point to the thrust of my post, I do not feel I need to argue one way or the other on this point. I feel it is fair to say that the OPC made a judgment and I am only pointing to that judgment. Are you saying Calvin held to the "Continental View" of the Sabbath because he quote-unquote 'Bowled' on the Sabbath? If this is true, I'd suggest reading Joey Pipa on the Sabbath. Also, the simple answer is that Calvin was coming out of Roman Catholicism as everyone was at that time. No one had a right view of the Sabbath. When Calvin first wrote the Institutes, most would say he bowled on the Sabbath. But it is clear that if read his other writings (including later editions of the Institutes) that he thought this to be a violation of the Sabbath. No recreation on the Sabbath my friend (for Calvin). The simple thing here is that Irons was kicked out of a denomination --> this is not good. There is something seriously wrong with someone's theology if they are kicked out of a denomination. "Logically, it is wrong because it presupposes that I have taken Kline’s views and extended them beyond Kline himself. But I am confident that my views are precisely the same as Kline’s in all the key areas, (e.g., my view of the Decalogue, covenant theology, civil government, etc.)." It seems to me that this [THE BOLDED] is exactly what Josh was pointing out about Lee Irons. Yet, however, in the non-key areas maybe Irons goes further and which then it affects, no doubt, key areas. Which, "coincidentally" is exactly what happened with the FV. In defense of Josh's diagram, I did think it was a clever and accurate way of showing how a lot of conservative Reformed people tend to view both the FV crowd as well as Lee Irons. They view both groups as being on extreme ends, and perhaps outside of Reformed orthodoxy itself. While I don't completely agree with it, I think it's a very true picture none-the-less of how many people view the situation with both groups. Peter Enns isn't close to the circle. You have to at least believe in the 5 fundamentals to even be close to being in the circle. Thank you for understanding what I was trying to do with this post. I will risk eliciting a collective groan from the readership of Bring the Books... and state that I, too, saw some "irony" in the statements made above. It seems that all that Irons and the few above have done is prove Josh's point. Yes, gentlemen, this would be the same Rev. Irons whose views--that were in question (i.e., "third use of Law")-- are similar to Rev. Stellman's on the same issue. BTW, I appreciate the views of both of these men (re: "third use"). Murray was staunchly within the bounds of the Reformed Confessions, in spite of his misguided pursuit of "biblical" terminology. Both Kline and Irons on the other hand are nowhere to be found in the Reformed Confessional tradition. 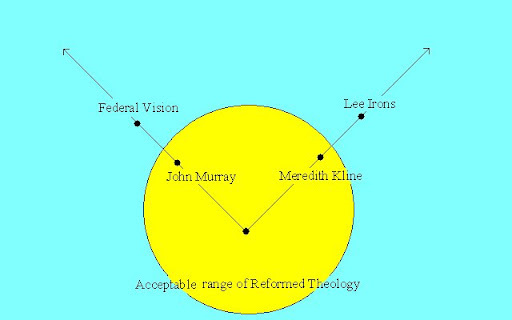 Federal Vision theology is far more based upon the hermeneutical/exegetical tradition established by Kline than anything in the Theological work of Murray. They heavily adopt Kline's school of thought on Theology proper, Anthropology, and Covenant theology. The few FV guys who aren't completely muddled on the doctrine of Justification (and there are a couple), are generally significantly more faithful to the Confessions than Kline or Irons. Thanks for the comment. Your understanding of the FV is one I have never heard before. Would you care to support it with quote and references. I am not sure why you think that the FV "is far more based upon the hermeneutical/exegetical tradition established by Kline than anything in the Theological work of Murray." And why do you think the FV "heavily adopt Kline's school of thought on Theology proper, Anthropology, and Covenant theology." Also, who are you thinking of when you say, "The few FV guys who aren't completely muddled on the doctrine of Justification (and there are a couple), are generally significantly more faithful to the Confessions than Kline or Irons."